Every time I’ve signed up for the Humana Rock ‘n’ Roll Chicago Half Marathon, I’ve done so with hesitation. A half marathon in the middle of July in Chicago is a bit of a gamble, and I will admit that I register expecting the worst. Little did I know just how much of “the worst” this year’s edition of the race would hold. “The worst” started on Saturday. A loved one got quite sick on Saturday (like, 103 degree fever quite sick), and to say that it stressed me out would be an enormous understatement. I spent most of Saturday vacillating between massive anxiety and crushing panic as their fever crept higher and higher (is there a difference? Not really, but it makes my writing sound fancier.) Instead of sleeping Saturday night into Sunday morning, I took what amounted to two, two-hour naps: one from 9:45 to 11:45, and another from 2:00 to 4:00. When I “officially” got up at 4:30 Sunday morning, I seriously considered bailing on the race, especially since I was still so wracked with anxiety that I could barely think straight. Sitting around my house stewing with worry wasn’t going to make anything better, though, so I figured I may was well attempt to burn off my anxious energy with a 13.1 mile run. It was overcast and cool for July when I got to Grant Park, but I wasn’t particularly concerned about the weather. It could’ve been much worse–hotter, more humid, sunnier–so I didn’t think much of it. I saw a girl from my running group when I got to Columbus, chatted with her for a bit, and went off to get myself into a portapotty line and the corrals. 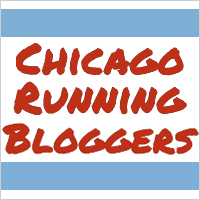 To everyone participating in Rock ‘n’ Roll Chicago’s credit, runners on Sunday’s race seemed to respect their assigned corral way more than the race field in San Diego or Seattle did, so there’s that. The corrals are still completely unenforced, but hey, nice to know people who show up in Chicago are more likely to follow their assignments! While we waited for the race to begin, it began to sprinkle. I knew there was rain in the forecast, and I was concerned it would rain for the first mile of the race and then quit, leaving us with humid conditions and wet clothes for the rest of the run. Having it start to rain while we were still waiting to cross the start line did nothing to reassure me that wouldn’t happen. Eventually we took off. This was my third Rock ‘n’ Roll Chicago, each time with the same course, and this time it seemed to take MUCH longer to get to the first mile than usual. When I lapped my watch at the first mile marker, it said it had taken me 12:52 to get there, which seemed both concerning and totally unreasonable. I know what it feels like to run 12:52, and the effort I was putting in did NOT match the effort I normally associate with a 12:52 mile. Either the mile marker was off or I was in big trouble. Even though I was tired and anxious, I still had enough mental wherewithal to remember that the first mile marker was almost always earlier in the past, and sure enough, when I looked it up on the course map, the mile marker on the course was beyond where the first mile was marked on the online course map. I completely missed the second mile marker and was getting awful worried about how long it took me to run the second mile until I realized I must’ve missed the sign – especially when I saw the mile three sign 😛 It rained on and off throughout all of this, just enough to keep things cool (and make the road slippery). I got better about noticing the mile markers and started to have a better idea of how fast I was running: pretty consistently in the 10:40-10:50 range. That was fine with me. I was out to finish as quickly as possible, but I also knew I wasn’t exactly in a position to PR. Back before this weekend happened, when I had things like “hopes” and “dreams” and “plans” for this race, I wanted to run the race close to my goal marathon pace to see how it would go. My goal marathon pace (for a 4:45) is a 10:52, so even though this was a little on the slow side as far what I ~really~ like for my half marathon pace, it’s ultimately what I wanted out of the race anyway. This is a screenshot of my Garmin map overlaid with a screenshot of the official course map. For whatever reason, my Garmin map only shows odd numbered laps, and remember that my lap number is off due to missing the mile two marker (so lap five was mile six, lap seven was mile eight, etc.). The course map show mile six at the intersection of Harrison and State (circled in blue), while the actual course marked mile six right before the corner of Harrison and Michigan (circled in orange). While downtown, the course mile markers were showing up after the course map shows where those miles should be, as we go farther south, the course mile markers are now showing up before where the course map shows those miles should be–and by a lot! The green circle shows where the map says mile eight was, while the yellow circle shows where mile eight was marked. The light blue circle shows where the map says mile 10 was, while the black circle shows where mile 10 was marked on the course. What the heck, Rock ‘n’ Roll?! How do you screw that up so badly?! And so inconsistently?! And hey, while we’re on the topic of course maps, would anyone like to explain to me why the courses in 2015 (screenshot here) and 2018 (full screenshot below) are identical except for the fact that in 2018, instead of running straight up Clark to Washington, we turned on Madison, took it to LaSalle and then turned on Washington, presumably adding distance to the race by running three sides of a block instead of one: distance that we don’t seem to lose anywhere else, despite the fact that allegedly both courses are 13.1 miles? (Although according to the 2015 certification, we did run around that block, even though the course map doesn’t show it). Or explain to me how miles eight, nine, and 10 are in WILDLY different locations on the 2018 map than they were on the 2015 maps, despite, once again, being the same course? Or explain to me how mile 11 is in one place in 2015 and another place in 2018, while mile 12 is in the same place both times? But then again, what you can you expect from the race series that promises you a vanity bib for running your third Rock ‘n’ Roll of the year as a reward for signing up for the Heavy Medals program months ago and ends up giving you the same one everyone else got, or the race series that sends out its Final Information email for Chicago with pictures of NASHVILLE. I enjoy Rock ‘n’ Roll events for the most part, but the devil is in the details, folks. And while no, none of this matters at all in the grand scheme of things–I do this for fun, as a way to motivate myself to keep training, as a convenient excuse to sleep in one Saturday during the summer–it’s those little things that really make or break my opinion of a race organizer. If you can’t get the little things right, why should I trust you to get the big things right? HOW can I trust you to get the big things right? The sun came out for a hot (literally) minute a little after I got to mile six, but fortunately the clouds covered it up soon after that. It was really humid when it wasn’t raining, and the sun only made that worse, so I was grateful for the clouds. I became a bit less grateful for them when I got to mile nine, however. There had been plenty of on and off sprinkles throughout the race, but when I was at mile nine, the skies absolutely opened up and it poured. Like, rain streaming down my visor, shoes saturated poured. It was one of those “What can you do?” sort of moments, and everyone around me seemed to take it in stride (heh puns). I don’t love running in pouring down rain, but with only a few miles left it didn’t bother me too much, at least in the moment. It bothered me when I finished and got cold due to my soaking wet clothes, but it made running more comfortable at least. I felt pretty good towards the end of the race. This year, they lined the entire part along Lake Shore Drive with semi trucks, which I really appreciated. Running so close to traffic on Lake Shore always made me a bit nervous, so to have a solid barrier made things feel substantially safer. I did a better job of not kicking too early this year, but I did keep a close eye on my watch all the way down Columbus. I thought I might be able to sneak in under 2:20, and lo and behold, I crossed the finish line in 2:19:12. That counts! I was in a hurry to get home (and it was raining…I think. I’ve lost track of when it was and wasn’t raining), so I didn’t stick around for any of the post-race stuff. I loaded up my arms with water, Gatorade and snacks, and made my way back to the CTA. All in all, I’m happy with my race. The weather, though not particularly friendly wasn’t nearly as bad as it could be in July in Chicago (2015 Rock ‘n’ Roll, I’m looking at you), and I’m glad my lack of sleep/abundance of anxiety didn’t disrupt things too much. I am annoyed that the shirt is, once again, identical to the ones I got in San Diego and Seattle last month, but at least the medal is different this time around. Rock ‘n’ Roll got bought by Ironman some time last summer (after RnR Chicago, but before Vegas), so it is under new management, but you would think that Ironman has a idea of what they’re doing when it comes to race management. But that whole conglomerate is owned by Dalian Wanda (https://www.nytimes.com/2017/06/02/sports/wang-jianlin-rock-n-roll-marathons-ironman-empire.html), so it’s this whole thing. I’m sure that doesn’t help matters. I too ran this race a couple of times and noticed that my watch never got the miles quite right. So I too had to start lapping between mile markers. I didn’t run the race this year BUT my goal is to sign up again for next years race while the prices are still really low! During the race I began asking people around me if they were finding a discrepancy at the mile markers. The overwhelming responses were yes yes yes. At the end of the race I had clocked 14.7 miles not 13.1. Just wondering if anyone else had such a huge difference in mileage? I’ve never had this happen at a race before. And I was running my watch and a phone app. Both were relatively identical. Anyone? If your watch and phone app provide maps that show where you ran, I would review those. Your GPS on both most likely got thrown off by the buildings downtown which can lead to some pretty weird things. My GPS map from my watch shows me running through several buildings downtown, for example. That will very quickly add “distance” to your run as far as your watch/phone is concerned, even though you’re not actually running where it thinks you’re running. If you don’t normally run around tall buildings, it can be really confusing (and concerning!) when it happens during a race like that, but it’s totally normal. The course was certified by USATF (you can find this year’s certification here: https://www.usatf.org/events/courses/maps/showMap.asp?courseID=IL17040NM) so it was definitely 13.1 miles regardless of what your watch or phone said. Now, that does mean it’s 13.1 miles if you ran the tangents absolutely perfectly, which is quite difficult to do, so most people end up adding a bit of distance to their race regardless and probably run 13.2, 13.3, maybe 13.4 miles total. But for extreme differences in overall distance, it’s almost always due to the buildings downtown for a race like this. I am glad your family member is better and hope they are still doing well! LOL, those mile markers. Like, they drew a new map instead of using an old one for the same course and moved them around? Sounds so unorganized!!!!! Ha. I am glad the weather didn’t ruin your race!!! I’d also much rather have rain then hot full sun! I just…sigh. Once again, it sounds like something that should be SO SIMPLE. Especially when the course is USATF certified!! The mile markers are right there on the certification! !